Thank you to my clients, friends, family and business associates who supported my business this past year. A portion of my commission from each transaction this past year was donated to the Royal LePage Shelter Foundation which in turn supports our local Guelph-Wellington Women in Crisis Centre. 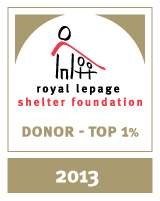 With your support I once again was honoured to be in the TOP 1% DONOR category. Below is the message from the Royal LePage Shelter Foundation. of Royal LePage’s 100th anniversary.